disciples, I remain resolutely languid. choice, still as puzzled and as dubious as I’ve always been. you – and that’s the inescapable truth. I only feel nauseous and ornery. athletic prowess, anything to do with competition makes me miserable. Solo activities like running or biking do not attract me in the least. And don’t even mention the gym to me. reading…which is my preferred activity, truth be told. The world is leaving me behind. But it’s ok.
Because I have this to keep me company. – Heat a non-stick skillet on medium-high heat. Add the oil. When the oil is hot, add the garlic. dangerous looking mass of bubbling orange sin. this patiently until the whites are set but the yolk remains runny. Sprinkle a little sea salt on the yolk. better yet onto a steaming mound of rice. does not like waiting around. I LOVE ALIGUE! My cholesterol level is proof! WIll try this for sure… now off I go to bed and dream of this for breakfast tomorrow! Wow, that is unique. I bet this fried egg tastes amazing. This sure looks so yummy for brekkie! Would love to try that one day. Hi Shalum! Now there's a thought! I've been having my morning omelette (3 eggs) with anchovies in butter since you posted that recipe, and this looks equally delicious! Ah yes the forever sports thing.. Says someone who was supposed to go to spinning class this morning but once again skipped… I like sports most of the time but I seem to have some trouble motivating myself and I really should. Now for that lovely egg I need no motivation! You're not alone..I enjoy all those lovely slow, indulgent things too. Food is definitely one of them..and a good breakfast, like this one, would definitely hit the spot. You write so well by the way. Now that is the very epitome of a sinful, glorious, utterly decadent breakfast. Bring on the toast! "Until then I suppose I’ll just have to be content with the passions I’ve been dealt. "–haha, I like this and consider it good advice. I will, too. Hi Mark! So happy to hear that you are liking the eggs in anchovy butter! Hope you like this one as well 🙂 The part though that would be not *too* healthy here would be the crab fat…high in cholesterol but oh so good! Hi Midge! Some mornings just call for sinful and glorious 😉 Bring on the rice as well! Hi Camz! Just saying it like it is 😉 Hope you like it! A very poetic explanation of your lack of interest in exercise. I can relate all too well! I love food decadence too which is why I MUST workout, hahaha. 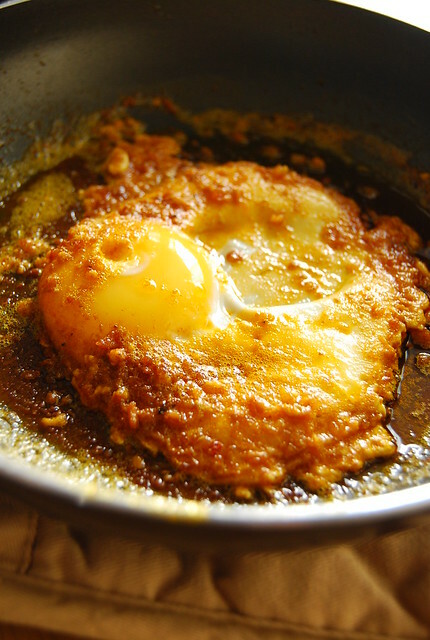 Yummy looking fried egg! I have never even heard of aligue, and don't have the first clue where I would look to try and get some. Any suggestions for possible substitutions? Hi Dexie! Thanks! I need to find some kind of exercise I enjoy, even a little, haha! I have never heard of aligue. That egg does look good. I like all those things you do but I do like a good hike in the bush or a swim in the waves. Do you already know the extra virgin olive oil Laudemio? I love it, let me know what you think about it. I still haven't cooked your egg with anchovy butter dish (keep forgetting), but I have a feeling this recipe will be tried sooner than that. Oh, you evil, evil woman, you! While eating my now-very-unhealthy fried rice with tuna, egg AND aligue, I texted F about it. He replied, "You're going to kill yourself!" I said, "So you don't want to taste it?" His text quickly arrived, "Yes, I do!!!" HAHAHA! Looks so deadly! But I love!! Hi Katrina! I know what you mean…I was thinking the same thing as I was cooking it (too decadent, unhealthy, etc) but of course that all disappeared when I tasted it 🙂 Not for everyday though! Hi Mirage! Yes, everything in moderation! 😉 Glad you enjoy it! I made this tonight! Unfortunately, my heat was too high again. 🙁 I've yet to learn exactly what people mean by "high," "medium-high," "low," etc. Oh, for the exactitude of baking, when 400 degrees is exactly that! 😉 Anyway, so I burned the garlic and aligue a bit, and the yolk wasn't as runny as I'd like, but it was still good. How could it NOT be, when I used the precious aligue I had my brother-in-law bring me from Capiz?! I kid you not, it is the BEST! It's so chunky, that even after you heat it up, not all of it melts. Hi Katrina! I am in love with your description of the special aligue! Well, as with everything in life, practice makes perfect…so go for it! But yes, maybe space it out, hehe 😉 So good right? Let me know how your next tries go! My next try will have to wait until someone comes from Capiz again, because I just used all the rest of it tonight, for pasta. YUM. Hi Mia! Haha! Nice to find a kindred food soul 🙂 And I love that you posted this comment on the fried egg in aligue post, hehehe!